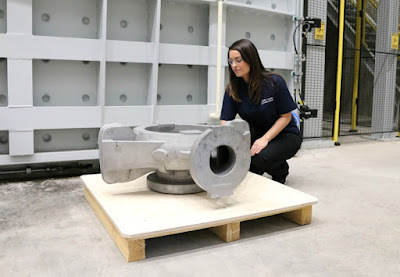 The Castings Group of the Advanced Manufacturing Research Centre (AMRC) has unveiled the largest ceramic shell titanium casting ever created from a single pour in Europe. The casting is a milestone test piece and will become a showcase for development of the AMRC's titanium casting facility on the Advanced Manufacturing Park (AMP) in Rotherham which became operational earlier this year. The large-scale, near net shape casting is an industrial centrifugal pump housing, used for highly corrosive applications in the chemical and petrochemical sectors. It was poured from a 680kg melt with a 200kg finished part weight. Richard Cook, general manager at AMRC Castings, said: "This test piece is a significant step forward for us and the UK as a whole. 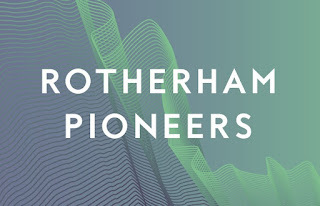 We are the UK's only titanium melting facility and this achievement, sends a clear signal that the country is open for business for large-scale titanium casting. "Global capacity for titanium castings, particularly of this size, is scarce – indeed it has actually decreased in recent years, despite growing demand. There is a clear need for this kind of capability and our research and development will underpin the ability for the UK to remain competitive in a global market." Casting can produce superior material properties to both forging and machining. In particular, the new furnace allows enhanced cooling to better control the material microstructure. A £7m government grant has supported the project with the new furnace part of a major investment and R&D programme, designed to enable UK companies to break into global markets for largescale titanium aerospace engine and structural components and is backed by the UK's Aerospace Technology Institute; innovation agency, Innovate UK; and High Value Manufacturing Catapult. AMRC Castings is now working towards its goal of pouring over 1,000kg of titanium for a 500kg part-weight centrispun casting by May 2018, testing the boundaries and limits of their Retech consumable electrode castings furnace. The furnace has three interchangeable crucibles capable of melting titanium for castings weighing up to 500kg and 2.000mm in diameter by 2,500mm in length. The group is already dealing with enquiries from companies wanting to exploit the technology and are currently conducting paper studies and piloting the first research projects. Matt Cawood, principal metallurgist at Cti, said: "The AMRC are currently engaged in several projects looking to improve capability and technology to enable more complex, higher integrity components to be designed for manufacture with improved metallurgical quality and increased dimensional accuracy. "Having the ability to pour large-scale castings as part of a research and development activity combined with the surrounding facility of industry-scale equipment and technical expertise is a unique offering that is drawing in many of the world's largest users of titanium castings to work with us."